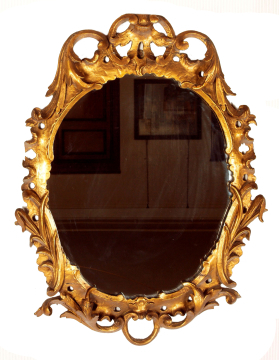 Oval rococo mirror, XF94, English, unknown maker, c.1750, gilt wood frame and mirror glass. ©Sir John Soane's Museum, London. Photograph: Hugh Kelly. Boldly carved with scrolling acanthus, rock work and palms, with an open cartouche at the bottom and modern mirror glass. This mirror does not appear in Soane’s Furniture and Fittings inventory but seems to be the one shown in the Housekeeper’s Room, later the Basement Ante Room in 1818 as shown in a section drawing through the Dome Area and Breakfast Room by Francis Copland (Vol. 83, 1). If it belonged to him then it was perhaps an item acquired early in his married life. If it was in his collection then it presumably hung on the second floor or in one of the servants’ bedrooms on the attic floor or in the basement at the end of his life. Mirrors with this somewhat flat rococo ornament, which may be ultimately derived from designs in Abraham Swan's British Architect (1745) are sometimes credited to Ireland, on no very strong evidence. Unfortunately, the back is paper covered and it is not possible to see whether it has an original label.